A life imitates art imitates life drama, Clouds Of Sils Maria offers layers of emotional discourse but remains narrowly constrained within a deeply personal story. Maria Enders (Juliette Binoche) is a middle-aged Europe-based star actress going through an ugly divorce. With help from her ever-present assistant and friend Valentine (Kristen Stewart), Maria is on her way to Switzerland to accept an award on behalf of reclusive writer Wilhelm when the shocking news arrives that he has committed suicide. Years earlier Maria had become a star playing an 18-year old provocative character called Sigrid who seduces middle aged mentor and businesswoman Helena in the Wilhelm-penned play Maloja Snake (a reference to stunning cloud formations through the Alp mountains). Now director Klaus Diesterweg (Lars Eidinger) wants Maria to take on the role of Helena in a reworking of the play, opposite brash up-and-coming American starlet Jo-Ann Ellis (Chloë Grace Moretz) as Sigrid. Taking up residence Wilhelm's house in the magical settlement of Sils Maria deep in the Swiss Alps, Maria struggles to emotionally prepare for the role of Helena. Val helps her with line readings, but a rift starts to emerge between the two women, Val expressing admiration for Jo-Ann's in-your-face talent and lifestyle and Maria trying to adapt to being the older woman. Directed and written by Olivier Assayas at Binoche's suggestion, Clouds Of Sils Maria contains parallels with Binoche's experiences at it exposes what goes on behind the curtains of a star performer's life. This is both the film's appeal and its limitation. For all its fly-on-the-wall, vulnerabilities-laid-bare credentials, for very long periods the script defaults to a two-person talkfest, Maria and Val engaged in cerebral conversations about the past and the present, revealing the plot of Maloja Snake through line readings as Maria struggles to face her present and future and let go of her ingenue past. The rehearsal scenes intentionally meld the lines between Helena / Sigrid and Maria / Val, and it's often pleasantly unclear what is a play and what is real life. To the extent that these scenes work at all is testimony to two flowing performances from Binoche and Stewart, heartily recruited as volunteer comrades representing their age groups. The broader applications of the dialogue to Maria's life, actresses' dimming wattage and appeal as middle age takes hold in a merciless industry, inter-generational divides and more broadly the rapidly changing role of women from young disruptors to mature victims of disruption are all compelling. But these are themes that reside between the lines of Clouds Of Sils Maria. The film is to be commended for triggering conversations; in itself, the viewing experience sometimes resembles watching paint dry. Ethereal elements creep into the story's final act, Maria facing up to her prospects and letting go of the past, in some cases literally. 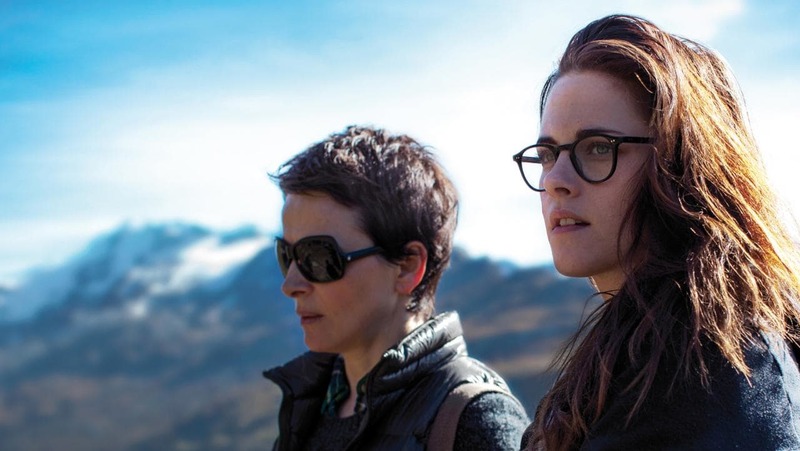 Clouds Of Sils Maria sits heavy in the sky, a largely private battle between provocative and pretentious.